Conventional wisdom in the U.S. is to bundle babies up and keep them indoors. But research and long held wisdom around the world tells us that infants and toddlers in well-designed outdoor spaces benefit from access to a wide variety of sensory stimuli the likes of which they just can’t experience indoors. Get on the ground with baby: Try getting down and giving your baby lots of direct contact with the earth. If going right onto the dirt or grass feels like a stretch for you or baby, start out on a blanket and watch your baby play with her hands and feet or with a few objects from home or nature that support exploration. Just moving the play you might do indoors outdoors offers baby the benefit of the sensations, sights and sounds of being outdoors. Mud Play! When you are ready for it, water, dirt, and mud make for wonderful play for baby. It will be messy, and some mud will likely make it into the mouth. But, the free, joyful exploration and sensory are so worth it! Join a community! 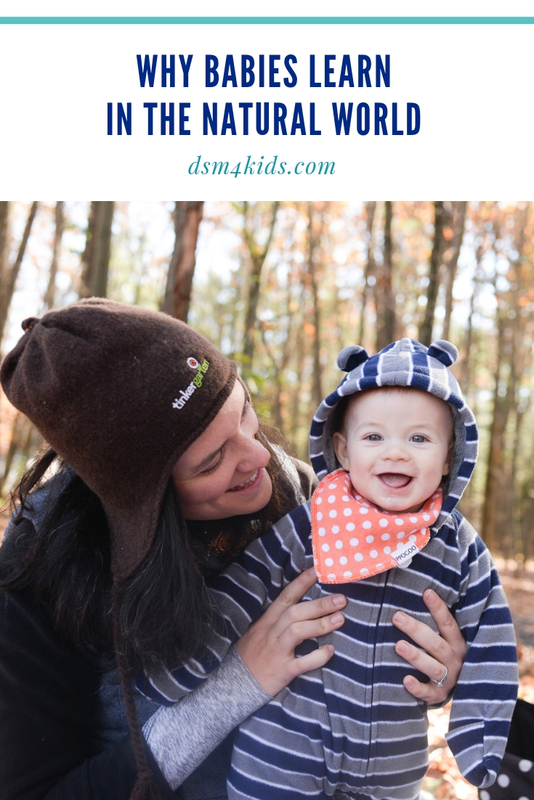 We love organizations like Hike It Baby that help get parents and babies spending more time together out in nature. We also offer a Tinkergarten class just for children ages 6 to 18 months and their caregivers. Visit https://tinkergarten.com/babies to find a class near you! Tinkergarten is on a mission to elevate childhood. We’re growing a technology-enabled network of leaders that bring families together in a natural place in their community for classes where kids learn through play. Each class becomes a tight-knit group of children and adults who learn together through well-designed, outdoor play-based activities. We help kids develop a host of important capabilities, including empathy, collaboration, creativity, persistence and problem solving. Our expert-designed classes and activities help kids develop core life skills while enjoying healthy, fun, engaging experiences in the physical freedom of local green spaces. Josie Mcclure, is a Tinkergarten leader based in Grimes, IA. Find a complete list of classes on her website at https://www.tinkergarten.com/leaders/josie.mcclure. Featured image provided by Tinkergarten.